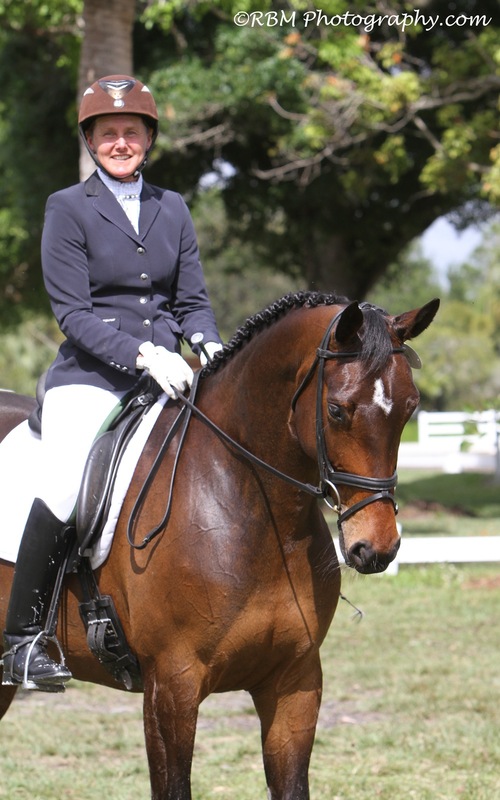 After a winter of training on her own and with Bill Warren and Jackie Brooks in the White Fences neighborhood of Wellington, superstar amateur rider and owner of Flingh’s Dream made a sensational finale at the Welcome Back to White Fences March Dressage Show. Flingh’s Dream is Lingh x Kira x Idocus, a 2010 mare that stands about 16.1. Bobbi Carleton, Flingh’s breeder adds “Flingh’s Dream” has exceeded all of my expectations on her first adventure to Florida. At the recent show and finale she won her class on Saturday and Sunday (Training Level 3)- Saturday with a 70.682 and Sunday with a 74.773 which was also the high score of the day!! She was also high score US bred and was awarded a lovely saddle pad embroidered with “Born in the USA!! I am so proud of my lovely young lady – her eagerness to please and to learn is unsurpassed! !” Bobbi chose to breed to Lingh for his ridability and gaits – and we are so glad she did! Congratulations Bobbi and Flingh. Sporthorse Legacy represents a variety of International stallions to North American breeders.